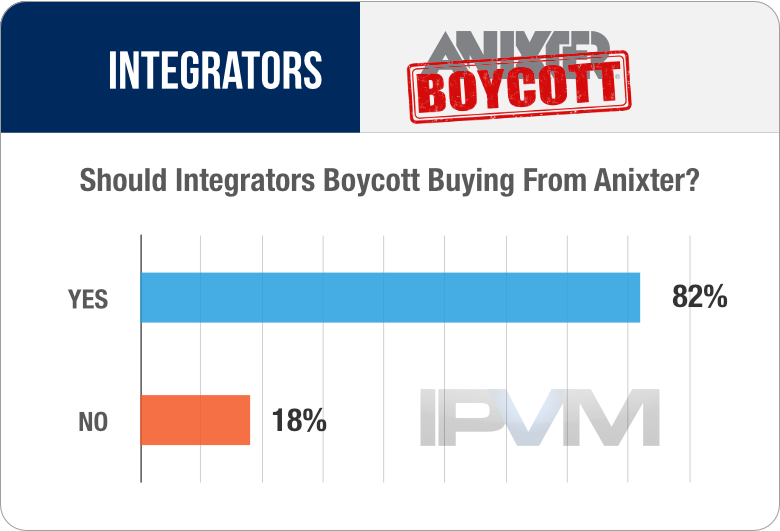 82% of 130 145 integrator respondents say integrators should boycott Anixter, in response to Anixter / Bosch Sells Direct to Amazon. This is the latest in a long line of events where Anixter sells direct to end users (e.g., 1, 2, 3). The issue is that Anixter has lied about it repeatedly over the years. They say that it doesn't happen - or it doesn't happen any more - but there's this long list of examples that just keeps growing.  Want to sell direct? Great. Be honest about it. Tell the manufacturer that you're going to sell their stuff without supporting it. Tell the integrator that you want them to buy from your warehouses, even though you're going to be bidding against them using wholesale prices. The best outcome for Anixter is to sell direct to end users, without integrators knowing, while having integrators still buy from them. However, as attention and integrator distrust builds, Anixter may face significant challenges from integrators boycotting them. Ran into them while walking a project about 12 months ago. This happens about every 12 months. They were finishing up their walk-through right before we started ours. I made a phone call to our Anixter rep and the Tri-Ed rep (owned by Anixter? Somehow they are affiliated) and they both 100% denied it. It was a flat out lie, especially when the potential customer said "it's only you and Anixter bidding this job." Later, we got a phone call from Tri-Ed saying "this was a rogue employee and it won't happen again," except this is the 3rd + time it has happened in the last few years, and every time they say "oh, right, just another rogue employee. Don't worry about it." We haven't spent a dollar with them for the past few years and we won't do so in the future. Yes, Anixter Acquired Tri-Ed in 2014. I genuinely wonder if that is (1) a stock Anixter / Tri-Ed excuse or (2) Anixter / Tri-Ed really has that little management / control over their employees. Anyone? These manufacturers clearly are trying to emulate the networking & computing business model in which manufacturers make their products available on an unrestricted open market. The big problem with that is that the security integration business, while there are some overlaps in the hardware and software used, is apples and oranges to the IT business model: Security integration involves architect & engineer involvement, CAD drawings, cabling infrastructure, poles, conduits, electric, furniture, in-depth knowledge of physical security practices in order to recommend, design, implement and maintain a solution. Selling cameras on the internet will not get these manufacturers far, because the cameras are useless without all the other components listed ( obviously not talking about some mickey-mouse office or corner deli with 3 or 4 cameras doing a DIY - that market is gone already and integrators even bothering to do a sales call at such establishments tend to be wasting their time). The IT business model is built primarily around "billable-hour professional services". The hardware and software quite often is purchased directly by the end-user under the advice or direction of the IT consultant. That's not feasible in security integration - there are too many moving parts and government licensing agencies and insurance companies involved with security to split the components and the labor in that manner. So what Anixter and others are doing is, to me, pointless. They render themselves an irrelevant commodity serving the market for small DIY projects. Michael: a valid point, and most of the jobs I've run into them are smaller, relatively speaking (2-10 cameras, or just a few doors of access control, or a small intrusion panel), consistent with your logic. However, the latest job, which I am referencing above, was an integrated access control and video project, which was a $250k project. I don't know if their intention was to win it, and then subcontract it out or if they have a team themselves that they claim could have delivered on it. Their go-to-market strategy can be whatever they want it to be, but just like them, we can do the same with our purchasing strategy. And our strategy involves not spending a $1 with them. Yes, completely agree. Our industry is a balanced ecosystem, with the understanding that it is the integrator alone who acts as the interface to the end-user; Central station monitoring, video & intrusion & door hardware, software, wire, etc all remain in the background behind us, because we are the only party capable of putting it all together and making it work. Any distributors attempting to go into the direct sales business and trying to turn us into Home Depot-like " preferred installers" need to be ostracized. Unfortunately, many small operators will not be able to resist the temptation of some distributor "feeding" them installation work. Hi All, Mike, great points. 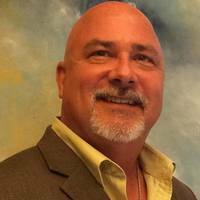 As an integrator my concern for the future is "how do I continue to provide value to my customers in this changing environment", given the commodization of products, the more educated end user, and the increased competition from everyone and their mother (now including distributers and DIY end users). Is the security industry going the way of the IT industry, the construction industry? No margin on parts, just labor. Is the channel eventually going to succumb to the laws of economics or is there real value in the channel. Honestly, I am not sure anymore. I like to think there is, as I think there is a lot to be said about getting it right the first time, but as I see new blood (a new IT manager taking over the physical security purse strings) continuing to shake things up to prove their worth, I get the feeling that my role as the "trusted advisor" for physical security technology is becoming more and more diminished over time and my role is reduced to "the boots on the ground", which can also be viewed as just a commodity. Anyway, my current strategy is to continue to provide value to my customers by finding customers that value what I have to offer, my thinking is that there will be fewer and fewer of these types as time rolls along, but there is always be an end user who like me to make their lives easier by doing all the work and taking on most of the risk for them. In all likelihood this will push Anixter to pursue more direct sales. I honestly look forward to the opportunity to compete against their telecom cabling sales personnel on a large security project. Their channel is limited where ours is not. As integrators we can pick the best product for the opportunity not just plug in items from our line card and hope they work. i do think pressuring the manufacturers routing through distribution will be more effective. For those recently complaining about low margins on Axis, their margin would be a bit better without the distributor margin in between. The value Anixter/Tried/Accutech offer to the manufacturers is logistics, but there is one company far better at this. If I were a manufacturer I would pay Amazon to handle stock. I am sure the manfacturers could work with Amazon to create preferred and project pricing options for each integrator that are not visible to the public at large. Amazon Business is slowly heading this way now. It is nice to receive text updates when equipment arrives, have actual tracking without asking, receive RMAs easily, and have some visibility into stock levels. #3, thanks, good comment! I started a new discussion here to examine that further: Would Amazon Provide More Value Than Anixter For Security Products Distribution? You margin, really wouldn't be better. Practically speaking here's how that scenario would/might likely go. Manufacturer would look to sell to you at their "dealer pricing level", and they certainly wouldn't want to leave margin out on the table to help you, regardless of what they tell you. Manufacturer would know that you can't really "price shop" their products, and be able to control your pricing better. Manufacturer would struggle because they rely on distributors to help with creating demand, especially for the every day small to medium jobs, and they would lose this benefit, as well as the service benefits. All product manufacturers will sell pruducts directly. No, they don't all sell directly. We've been handed high volume sales by our VMS partner to customers that repeatedly asked them to buy direct, but they brought us the sale because the VMS company respects the promise of exclusivity to integrator partners. We have always sought business partners that aren't also competitors. It's hard to draw absolutes, but for distributors who pursue direct sales (Anixter and others), we do as little business with them as possible, and the same with "open distribution" manufacturers like AXIS, it just doesn't serve our best interest, nor that of most integrators, in my opinion. 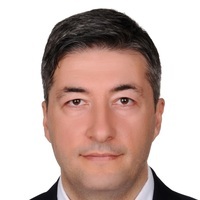 You can choose direct relationships with manufacturers and there are some distributors and distributor models who I believe make a genuine effort not to sell direct to end users: Scansource and PSA Security among them in my experience. With all the price pressure from the Orient on all Security Products don't be surprised if more distributors follow the direct sales model. No one is making any money these days selling CCTV products not even integrators. Graybar does the same thing. They sold a large access control job and quoted the customer dealer cost on the controllers. Now the integrator has no profit for cushion in case the quoted labor goes over. Well, that's just irresponsible and sounds like they didn't think it through. But on the other hand, the end user must realize that they cannot have their cake and eat it too. If you want to go around the integrator and also mislead the reseller that you are doing it all in house, then don't expect the integrator to run over for service calls, or to give you a great deal on labor. It all plays a role. I can get good pricing on lumber, or plumbing materials, or I can get the materials from the contractors. Trade-offs are how knowledgeable am I, and how much is my time worth to make sure I am getting the correct materials. The other angle is, was the integrator giving the end user what they wanted? There are so many details and every situation is unique. From 30+ years of experience, all manufacturers DO NOT and WILL NOT sell direct! We partner with one who doesn't, under any circumstances! Many manufacturers who have jumped on to this slippery slope (over the years) have fallen dramatically and most resulted in their ultimate demise! An 82% Boycott is a strong number! This and growth towards a Full Boycott is likely to get their attention and, should change their behavior! If not, they too will ultimately disappear or evolve into something much smaller and insignificant. I wouldn't mind participating in a private data base of what manufacturers will and will not sell direct and under what circumstances. I was sitting in a closed door meeting with a customer who was responsible for electronic security at a major Fortune 500 company, when the IT Manager came busting in with one of his reps in tow: you guessed it: Anixter. He excitedly introduced him and blurted out " They can sell us all your security products too!". I held my notepad over the logo of my shirt which identified my company and got to hear his pitch for 5 minutes about how he could sell him all the security equipment he needed: HID readers, cards, power supplies, cameras, NVRs, etc... The intent was obvious: they would gladly sell this direct. Slowly after a few minutes he noticed me, and as he began sweating and fumbling, he finally introduced himself, as did I. Suddenly they only sold through their integration partners. Another rogue employee I suppose! I quoted the National Guard a pair of Axis Q6114-E PTZ cameras and mounts yesterday. 2 People quoted it. Me and ADI. ADI quoted them 200.00 over my cost and I'm a Axis Channel Partner. .....they did this in another bid here in Florida! I have had the opposite experience. Several times in the past few years my Anixter rep has called me to say he has an end user looking to buy. He referred them to us and we made the sale. Two of my better customers were acquired this way. Of course, that happens when the end-user needs some additional or special support, installations or services that Anixter cannot provide! I could show you evidence however that Anixter has attended pre-bid meetings, submitted bids on end user projects and attended the bid opening to see how their bid faired against the integrators and others participating. So... they don't sell direct huh...? The majority of manufactuers in the security industry highly value proper sales channels. Many have a different strategy; 3rd party reps, direct to integrators, exclusively through distribution, or hybrid models. Typically, the SI has the best support and best margin within the various sales channel mixes. I highly disagree that SI makes no money on camera hardware anymore. Many of my SI average 40% GM on just the video hardware vs 8% on networking hardware, while the distributor will make 13-25% GM. This is an effect of how manufacturers participate in the channel. 3. Their sales and marketing strategy and/or competency is poor. Interestingly, networking and IT-focused companies who entered the IP Video space were really selling themselves short because 8% margin was status quo. Some still accept this on IP Video products in order to win a bid or because it is still "not their focus", but that leaves money on the table and cameras are more complicated and typically require more support than a switch. Although, SI must understand the complicated dynamics of such a high profile contract. Typically, whoever did the work and has the deepest relationship has the justified power to run the product through the channel how they want. If Anixter owns the opportunity, they get to decide what to do. SI should not feel entitled involvement. The issue is that Anixter constantly lies about it and Bosch has a good channel strategy to support SI involvement. It is almost always worse for the entire channel not to have a certified SI involved and negotiate at least a box sale pass-through no matter what resources/expertise end user claims they have. If you want to avoid distribution games, it is an immediately fireable offense if anyone at Scansource sells direct to an end user, even if it is a single BNC connector. Unlike almost all major security distributors, Scansource doesnt even have an end user facing sales group.